As I mentioned earlier, we are hoping to give away other Puritan works each month as a way to provide additional resources regarding Puritan literature. The books we are looking to give away are other Puritan Paperbacks not in the challenge as well as biographical and historical works on the Puritans. At the end of the year, for those who read all twelve books, there will be a special giveaway to be announced. 1. 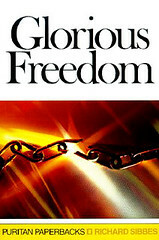 Glorious Freedom by Richard Sibbes. Description: The original title of this study was “The Excellency of the Gospel Above the Law”, being a comparison of the greater and full revelation of God in the New Covenant. This book is his exposition of 2 Corinthians 3:17-18, and Sibbes joyfully shows us how the Spirit of God produces likeness to Christ and consequent great liberty in those who are members of it. (This is the second Puritan Paperback reprint published by Banner of Truth by Sibbes.) Retail: $8.00. 2. Richard Sibbes: Puritanism and Calvinism in Late Elizabethan and Early Stuart England by Mark Dever. Description: Mark Dever does a scintillating and penetrating study of the life of Sibbes. 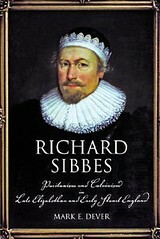 His sensitive and surefooted exposition of Sibbes’ theological position is fresh and he portrays Sibbes as “one of the last great Reformed preachers of England to believe in theory and know in practice an officially undivided covenant community.” He brings to his exposition of Sibbes’ subtle and highly personal practical divinity a wide and deep acquaintance with sixteenth and seventeenth-century Reformed theology, but also a sensibility which is warmly sympathetic to the nuances of Sibbes’ writing while remaining sharply and critically alert. The result is a marvelously lucid and persuasive account of a key moment in the evolution of early modern protestant thought, in a period which Sibbes himself described as “the best tymes of the gospel.” Retail: $19.95. 3. Meet the Puritans by Joel Beeke and Randall Pederson. Description: The most comprehensive guide to the Puritans in print. This work provides great biographical information on each of the Puritans along with a annotated description of all their works and reprints. Not only does it cover the English Puritans, but it also provides resources on the Scottish and Dutch Reformed traditions. The book also has a great reference index, including a lengthy bibliography and glossary of terminology. Shepherd’s Scrapbook named it the 2006 Book of the Year, and for good reason! Retail: $35.00. To qualify for the January giveaway, you need to make sure you have provided your name in the comment section of the introductory post. Out of the list of names, a random number will be selected and the winner will be announced on the blog. Give aways in future months will be determined by the responses to an open thread at the end of the month where everyone will have an opportunity to share their thoughts on the book. Let me say a special thanks to Reformation Heritage Books who have been so supportive of this project. They have been incredibly helpful and generous, not only by providing these books for the giveaway, but also providing excellent ideas and encouragement along the way. Let me encourage you to consider checking out their bookstore if you plan on purchasing online as they have some of the lowest prices on great reformed and Puritan literature anywhere.